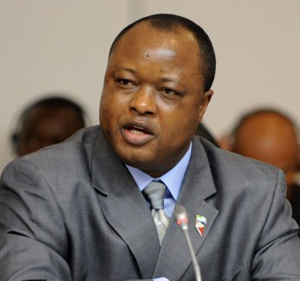 After Friday’s shocking news of the expulsion of Sierra Leone’s beleaguered vice president Sam Sumana from the ruling APC party, its National Advisory Committee (NAC), yesterday ended speculations as to the reasons for their decision. The party issued a statement which goes deep into the heart of the matter, but falls far short of giving direction and recommendation, regarding his capacity and ability to continue his constitutional role as vice president. This decision rests with president Koroma, who now may be forced to advice his parliamentary group of MPs, who makes up the majority in parliament, to table an impeachment motion. The official statement describes the vice president as fraudulent and treacherous. But the vice president has not been given the chance to answer to the allegations that led to his expulsion from the party. He is in a self-imposed Ebola quarantine. Our Party has been in existence for over 54 years and has succeeded in drawing its support from the grassroots and ordinary Citizens. 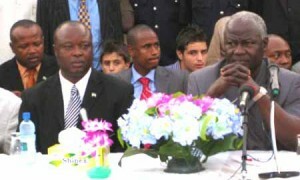 It has produced three democratically elected Presidents and has led this country for 32 years. These developments were the result of discipline and hard work by the Party and its membership. That is why, after receiving a spate of complaints about indiscipline and anti-party activities perpetuated by certain party members, including Comrades Alhaji Samuel Sam Sumana, Kainde Bangura, Dora Conteh, Haja Bitar, Mabinty Waterloo, Umu Naomi Barrie, Catherine Hallowell and Alvina Cole Showers, an Investigation Committee was set up on November 13, 2014 by the National Advisory Committee (NAC), the second highest organ in the Party Structure. The mandate of the Committee was to investigate complaints forwarded to it by the NAC and to prepare a report containing its findings and recommendations for the attention of the National Advisory Committee. Over a period of three months, the Committee extensively interviewed and also received audio-visual evidence from complainants, accused and witnesses to back up the process. Following the submission of the report of the Investigating Committee to the National Advisory Committee (NAC), the National Advisory Committee on March 6, 2015, convened a meeting to discuss the report. The NAC unanimously decided to expel Comrade Alhaji Samuel Sam Sumana (Photo) from the party pursuant to Article 8 of the 1995 Constitution of the Party for anti-party activity, fermenting violence, deceit, false statement amounting to fraud, inciting hate, threatening the personal security of key party functionaries, flouting of rulings and decisions of the party, carrying out anti-party propaganda, and engaging in activities inconsistent with the achievements of the party’s objectives. Pursuant to the same Article 8, the National Advisory Committee has expelled Comrade Madam Kainde Bangura for fermenting violence, disobedience, and carrying out anti-party activities. NAC also invoked Article 8 of the Party’s 1995 Constitution to suspend Tamba Sandi; reprimand Comrade Diana Konomanyi; fine and strongly warn Comrades Dora Conteh, Haja Bitar, Mabinty Waterloo, Umu Naomi Barrie and Catherine Hallowell. The Committee having found no evidence against Alvina Cole Showers recommends that she be exonorated.